↑ «JioPhone Operating System (Android or KaiOS or Firefox OS)». www.jio4gmobile.in. ↑ Lunden, Ingrid. «KaiOS, a feature phone platform built on the ashes of Firefox OS, adds Facebook, Twitter and Google apps». ↑ «KaiOS, Here's everything you should know about the operating system available in JioPhone — Mobile Studio». 24 de agosto de 2017. ↑ Barton, James. «KaiOS Emerging OS - Developing Telecoms». www.developingtelecoms.com. ↑ «Reliance Jio LYF 4G VoLTE feature phone: To run KaiOS, will have an app store too». 20 de julio de 2017. ↑ «All you need to know about KaiOS that runs on Jio feature phone». www.blogpoke.com. ↑ «Alcatel GO FLIP™». 16 de junio de 2017. ↑ «The Cingular Flip 2 is AT&T's newest clamshell phone». ↑ «[Exclusive] Reliance Jio and Lyf's 4G VoLTE Feature Phone». 13 de julio de 2017. ↑ «Jio Phone Booking - Pre Book Jio Mobile Online for 500 Only - Jio». www.jio.com. 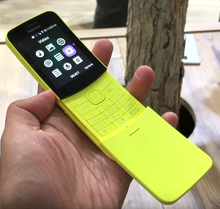 ↑ «The Nokia 8110 is back». ↑ «Doro's 7050 Is the Next Great Simple Phone». 26 de febrero de 2018. ↑ «MWC 2018: Kai Announces Partnerships with Mobile Industry Giants - KaiOS». 26 de febrero de 2018. ↑ Krishna, Sai (27 de febrero de 2018). «KaiOS 2.5 will run on feature phones with Qualcomm, Spreadtrum chipsets with just 256MB RAM» (en inglés). Fonearena.com. Consultado el 12 de mayo de 2018.